For the medical journals, see Anesthesiology (journal) and Anaesthesia (journal). For the song "Anaesthetist", see Enter Shikari. Anesthesiology, anaesthesiology, anaesthesia or anaesthetics (see Terminology) is the medical speciality concerned with the total perioperative care of patients before, during and after surgery. It encompasses anesthesia, intensive care medicine, critical emergency medicine, and pain medicine. A physician specialised in this field of medicine is called an anesthesiologist, anaesthesiologist or anaesthetist, depending on the country (see Terminology). The core element of the specialty is the study and use of anesthesia and anesthetics to safely support a patient's vital functions through the perioperative period. Since the 19th century, anesthesiology has developed from an experimental area with non-specialist practitioners using novel, untested drugs and techniques into what is now a highly refined, safe and effective field of medicine. In some countries anesthesiologists comprise the largest single cohort of doctors in hospitals, and their role can extend far beyond the traditional role of anesthesia care in the operating room, including fields such as providing pre-hospital emergency medicine, running intensive care units, transporting critically ill patients between facilities, and prehabilitation programs to optimize patients for surgery. In North America and China, the medical study and application of anesthetics is called anesthesiology, and a physician in the specialty is called an anesthesiologist. In these countries, the word "anesthetist" is used to refer to advanced non-physician providers of anesthesia services such as anesthesiologist assistants and nurse anesthetists. In some countries that are current or former members of the Commonwealth of Nations–namely, United Kingdom, Australia, New Zealand and South Africa–the medical specialty is instead referred to as anaesthesia or anaesthetics, with an extra "a". As such, in these countries the same term may be used to refer to the overall medical specialty, the medications and techniques that are used, and the resulting state of loss of sensation. The term anaesthetist is used only to refer to a physician practising in the field; non-physicians involved in anaesthesia provision use other titles in these countries, such as "physician assistant". Some countries which formerly used "anaesthesia" and "anaesthetist", such as Ireland and Hong Kong, have transitioned to "anaesthesiology" and "anaesthesiologist", or are in the process of transition. In most other parts of the world, the spelling anaesthesiology is most commonly used when writing in English, and a physician practising it is termed an anaesthesiologist. This is the spelling adopted by the World Federation of Societies of Anaesthesiologists and most of its most of its member societies, as well as the European Society of Anaesthesiology, and it is the most commonly used term found in the titles of medical journals. The name derives from the Ancient Greek roots ἀν- an-, "not", αἴσθησις aísthēsis, “sensation”, and -λογία -logia, "study". As a specialty, the core element of anesthesiology is the practice of anesthesia. This comprises the use of various injected and inhaled medications to produce a loss of sensation in patients, making it possible to carry out procedures that would otherwise cause intolerable pain or be technically unfeasible. Safe anesthesia requires in-depth knowledge of various invasive and non-invasive organ support techniques that are used to control patients' vital functions while under the effects of anaesthetic drugs; these include advanced airway management, invasive and non-invasive hemodynamic monitors, and diagnostic techniques like ultrasonography and echocardiography. Anesthesiologists are expected to have expert knowledge of human physiology, medical physics, and pharmacology, as well as a broad general knowledge of all areas of medicine and surgery in all ages of patients, with a particular focus on those aspects which may impact on a surgical procedure. 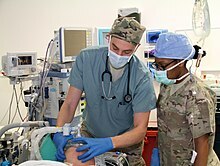 In recent decades, the role of anesthesiologists has broadened to focus not just on administering anesthetics during the surgical procedure itself, but also beforehand in order to identify high-risk patients and optimize their fitness, during the procedure to maintain situational awareness of the surgery itself so as to improve safety, as well as afterwards in order to promote and enhance recovery. This has been termed "perioperative medicine". The concept of intensive care medicine arose in the 1950s and 1960s, with anesthesiologists taking organ support techniques that had traditionally been used only for short periods during surgical procedures (such as positive pressure ventilation), and applying these therapies to patients with organ failure, who might require vital function support for extended periods until the effects of the illness could be reversed. The first intensive care unit was opened by Bjørn Aage Ibsen in Copenhagen in 1953, prompted by a polio epidemic during which many patients required prolonged artificial ventilation. In many countries, intensive care medicine is considered to be a subspecialty of anesthesiology, and anesthesiologists often rotate between duties in the operating room and the intensive care unit. This allows continuity of care when patients are admitted to the ICU after their surgery, and it also means that anesthesiologists can maintain their expertise at invasive procedures and vital function support in the controlled setting of the operating room, while then applying those skills in the more dangerous setting of the critically ill patient. In other countries, intensive care medicine has evolved further to become a separate medical specialty in its own right, or has become a "supra-specialty" which may be practiced by doctors from various base specialties such as anesthesiology, emergency medicine, general medicine, surgery or neurology. Anesthesiologists have key roles in major trauma, resuscitation, airway management, and caring other patients outside the operating theatre who have critical emergencies that pose an immediate threat to life, again reflecting transferable skills from the operating room, and allowing continuity of care when patients are brought for surgery or intensive care. This branch of anesthesiology is collectively termed critical emergency medicine, and includes provision of pre-hospital emergency medicine as part of air ambulance or emergency medical services, as well as safe transfer of critically ill patients from one part of a hospital to another, or between healthcare facilities. Anesthesiologists commonly form part of cardiac arrest teams and rapid response teams composed of senior clinicians that are immediately summoned when a patient's heart stops beating, or when they deteriorate acutely while in hospital. Different models for emergency medicine exist internationally: in the Anglo-American model, the patient is rapidly transported by non-physician providers to definitive care such as an emergency department in a hospital. Conversely, the Franco-German approach has a physician, often an anesthesiologist, come to the patient and provide stabilizing care in the field. The patient is then triaged directly to the appropriate department of a hospital. The role of anesthesiologists in ensuring adequate pain relief for patients in the immediate postoperative period, as well as their expertise in regional anesthesia and nerve blocks, has led to the development of pain medicine as a subspecialty in its own right. The field comprises individualized strategies for all forms of analgesia, including pain management during childbirth, neuromodulatory technological methods such as transcutaneous electrical nerve stimulation or implanted spinal cord stimulators, and specialized pharmacological regimens. Over the past 100 years, the study and administration of anesthesia has become more complex. Historically anesthesia providers were almost solely utilized during surgery to administer general anesthesia in which a person is placed in a pharmacologic coma. This is performed to permit surgery without the individual responding to pain (analgesia) during surgery or remembering (amnesia) the surgery. In the nineteenth century the beginnings of general anesthesia started with the introduction of ether in Boston and chloroform in the United Kingdom to bring about a state of unawareness and unresponsiveness to the pain of surgical insult. With the isolation of cocaine in the mid-nineteenth century there began to be drugs available for local anesthesia. By the end of the nineteenth century the number of pharmacological options increased and they began to be applied both peripherally and neuraxially. Then in the twentieth century neuromuscular blockade allowed the anesthesiologist to completely paralyze the patient pharmacologically and breath for him or her via mechanical ventilation. With these new tools the anesthetist could intensively manage the patient's physiology bringing about critical care medicine, which, in many countries, is intimately connected to anesthesiology. Anatomical knowledge of the nervous system for nerve blocks, etc. Many procedures or diagnostic tests do not require "general anesthesia" and can be performed using various forms of sedation or regional anesthesia, which can be performed to induce analgesia in a region of the body. For example, epidural administration of a local anesthetic is commonly performed on the mother during childbirth to reduce labor pain while permitting the mother to be awake and active in labor and delivery. In the United States, anesthesiologists may also perform non-surgical pain management (termed pain medicine) and provide care for patients in intensive care units (termed critical care medicine). The length and format of anesthesiology training programs varies from country to country. A candidate must first have completed medical school training to be awarded a medical degree, before embarking on a programme of postgraduate specialist training or residency which can range from four to nine years. Anesthesiologists in training spend this time gaining experience in various different subspecialties of anesthesiology and undertake various advanced postgraduate examinations and skill assessments. These lead to the award of a specialist qualification at the end of their training indicating that they are an expert in the field and may be licensed to practice independently. In Argentina, residency programs are five years long. In Australia and New Zealand, training is supervised by the Australian and New Zealand College of Anaesthetists, while anaesthetists are represented by the Australian Society of Anaesthetists and the New Zealand Society of Anaesthetists. The ANZCA-approved training course encompasses an initial two-year long Pre-vocational Medical Education and Training (PMET) and five years of supervised clinical training at approved training sites. Thus the total training following graduation from medical school is seven years long. Trainees must pass both the primary and final examinations which consist of both written (multiple choice questions and short-answer questions) and, if successful in the written exams, oral examinations (viva voce). In the final written examination, there are many questions of clinical scenarios (including interpretation of radiological exams, EKGs and other special investigations). There are also two cases of real patients with complex medical conditions - for clinical examination and a following discussion. The course has a program of 12 modules such as obstetric anaesthesia, pediatric anaesthesia, cardiothoracic and vascular anaesthesia, neurosurgical anaesthesia and pain management. Trainees also have to complete an advanced project, such as a research publication or paper. They also undergo an EMAC (Effective Management of Anaesthetic Crises) or EMST (Early Management of Severe Trauma) course. On completion of training, the trainees are awarded the Diploma of Fellowship and are entitled to use the qualification of FANZCA – Fellow of the Australian and New Zealand College of Anaesthetists. In Brazil, approximately 650 physicians are admitted yearly to a three-year specialization program. The residency programs can take place at training centers in university hospitals. These training centres are accredited by the Brazilian Society of Anesthesiology (SBA), or other referral hospitals accredited by the ministry of health. Most of the residents are trained in different areas, including ICU, pain management, and anesthesiology sub-specialties, including transplants and pediatrics. In order to be a certified anesthesiologist in Brazil, the residents must undergo exams throughout the residency program and at the end of the program. The SBA conducts these examinations. In order to be an instructor of a residency program certified by the SBA, the anesthesiologists must have the superior title in anaesthesia, in which the specialist undergoes a multiple choice test followed by an oral examination conducted by a board assigned by the national society. In Canada, training is supervised by 17 universities approved by the Royal College of Physicians and Surgeons of Canada. Upon completion of a residency program (typically five years long), the candidate is required to pass a comprehensive objective examination consisting of a written component (two three-hour papers: one featuring 'multiple choice' questions, and the other featuring 'short-answer' questions) and an oral component (a two-hour session relating to topics on the clinical aspects of anesthesiology). The examination of a patient is not required. Upon completion of training, the anaesthesia graduate is then entitled to become a "Fellow of the Royal College of Physicians of Canada" and to use the post-nominal letters "FRCPC". In Germany, after earning the right to practice medicine (German: Approbation), German physicians who want to become anaesthesiologists must undergo 5 years of training, consisting of anaesthesiology, ECG and pulmonary function testing, critical care and pain medicine, and also palliative care medicine. The training includes rotations serving in the operation theatres to perform anaesthesia on a variety of patients being treated by various surgical sub-specialties (e.g. general surgery, neurosurgery, invasive urological and gynecological procedures), followed by a rotation through various intensive-care units. Many German anaesthesiologists choose to complete a curriculum in emergency medicine, which once completed, enables them to be referred to as Notarzt [de], an emergency physician working pre-clinically with the emergency medical service. In pre-clinical settings the emergency physician is assisted by paramedics. In the Netherlands, anaesthesiologists must complete medical school training, which takes six years. After successfully completing medical school training, they start a five-year residency training in anaesthesiology. In their fifth year they can choose to spend the year doing research, or to specialize in a certain area, including general anaesthesiology, critical care medicine, pain and palliative medicine, paediatric anaesthesiology, cardiothoracic anaesthesiology, neuro-anaesthesiology or obstetric anaesthesiology. In Guatemala, a student with a medical degree (he or she must have surgery and general medicine skills by law) has to complete a residency of six years (five years in residency and one year of practice with an expert anaesthetist). After residency, students take a board examination conducted by the college of medicine of Guatemala, the Universidade De San Carlos De Guatemala (Medicine Faculty Examination Board), and a chief physician who represents the health care ministry of the government of Guatemala. The examination includes a written section, an oral section, and a special examination of skills and knowledge relating to anaesthetic instruments, emergency treatment, pre-operative care, post-operative care, intensive care units, and pain medicine. After passing the examination, the college of medicine of Guatemala, Universidad De San Carlos De Guatemala and the health care ministry of the government of Guatemala grants the candidate a special license to practice anaesthesia as well as a diploma issued by the Universidad De San Carlos De Guatemala granting the degree of physician with specialization in anaesthesia. Anaesthetists in Guatemala are also subject to yearly examinations and mandatory participation in yearly seminars on the latest developments in anaesthetic practice. In Italy, a medical school graduate must complete an accredited five-year residency in anesthesiology. In Denmark, Finland, Iceland, Norway, and Sweden, anesthesiologists' training is supervised by the respective national societies of anesthesiology as well as the Scandinavian Society of Anaesthesiology and Intensive Care Medicine. In the Nordic countries, anesthesiology is the medical specialty that is engaged in the fields of anesthesia, intensive care medicine, pain control medicine, pre-hospital and in-hospital emergency medicine. Medical school graduates must complete a twelve-month internship, followed by a five-year residency program. SSAI currently hosts six training programs for anesthesiologists in the Nordics. These are Intensive care, Pediatric anesthesiology and intensive care, Advanced pain medicine, Critical care medicine, Critical emergency medicine, and Advanced obstetric anesthesiology. In England, Northern Ireland, Scotland, and Wales, training is supervised by the Royal College of Anaesthetists. Following the completion of medical school training, physicians enter a two-year foundation program which consists of at least six, four-month rotations in various medical specialties. It is mandatory for all physicians to complete a minimum of three months of general medicine and general surgery training during this time. Following the foundation program, physicians compete for specialist training. The training program in the United Kingdom currently consists of two years of core training and five years of higher training. Before the end of core training, all trainees must have passed the primary examination for the diploma of Fellowship of the Royal College of Anaesthetists (FRCA). Trainees wishing to hold dual accreditation in anaesthesia and intensive care medicine may enter anaesthesia training via the Acute Care Common Stem (ACCS) program which lasts three years and consists of experience in anaesthesia, emergency medicine, acute medicine and intensive care. Trainees in anaesthesia are called Specialty Registrars (StR) or Specialist Registrars (SpR). The Certificate of Completion of Training (CCT) in anaesthesia is divided into three levels: Basic, intermediate and advanced. During this time, physicians learn anaesthesia as applicable to all surgical specialties. The curriculum focuses on a modular format, with trainees primarily working in one special area during one module, for example: cardiac anaesthesia, neuro-anaesthesia, ENT, maxillofacial, pain medicine, intensive care, and trauma. Traditionally (before the advent of the foundation program), trainees entered anaesthesia from other specialties, such as medicine or accidents and emergencies. Specialist training takes at least seven years. On completion of specialist training, physicians are awarded CCT and are eligible for entry on the GMC Specialist register and are also able to work as consultant anaesthetist. A new consultant in anaesthetics must have completed a minimum of 14 years of training (including: five to six years of medical school training, two years of foundation training, and seven years of anaesthesia training). Those wishing for dual accreditation (in Intensive care and anaesthesia) are required to undergo an additional year of training and also complete the Diploma in Intensive Care Medicine (DICM). Pain specialists give the Fellowship of the Faculty of Pain Medicine of the Royal College of Anaesthetists (FFPMRCA) examination. Following medical school training, anesthesiology residency programs in the United States require successful completion of four years of residency training at an ACGME approved program for board certification eligibility in the specialty of anesthesiology. Anesthesiology residents face multiple examinations during their residency, including exams encompassing physiology, pathophysiology, pharmacology, and other medical sciences addressed in medical school, along with multiple anesthesia knowledge tests which assess progress during residency. Successful completion of a board exam after completion of residency is required for board certification. Residency training in the U.S. encompasses the full scope of perioperative medicine, including pre-operative medical evaluation, management of pre-existing disease in the surgical patient, intraoperative life support, intraoperative pain control, intraoperative ventilation, post-operative recovery, intensive care medicine, and chronic and acute pain management. After residency, many anesthesiologists complete an additional fellowship year of sub-specialty training in areas such as pain management, sleep medicine, cardiothoracic anesthesiology, pediatric anesthesiology, neuroanesthesiology, regional anesthesiology/ambulatory anesthesiology, obstetric anesthesiology, or critical care medicine. Dental anesthesiology is an emerging field for some dentists in the United States, who must have completed an undergraduate college program (that includes pre-medical requirements) and four years of dental school training. Dentist anesthesiology residency programs in the United States require successful completion of two years of residency training. The average salary for a full-time anesthesiologist is roughly $269,600, according to US News. The number of jobs are rounding to about 170,400 according to statistics in 2014. The majority of anesthesiologists in the United States are board-certified, either by the American Board of Anesthesiology (ABA) or the American Osteopathic Board of Anesthesiology (AOBA). D.O. anesthesiologists can be certified by the ABA. The ABA is a member of the American Board of Medical Specialties, while the AOBA falls under the American Osteopathic Association. Both Boards are recognized by the major insurance underwriters in the U.S. as well as by all branches of the U.S. Uniformed Services. Board certification by the ABA involves both a written and an oral examination. AOBA certification requires the same exams, in addition to a practical examination with examining physicians observing the applicant actually administering anesthetics in the operating room. ^ "What is Anesthesiology". Archived from the original on 2016-12-21. Retrieved 5 December 2016. ^ "Helsinki Declaration on Patient Safety in Anaesthesiology". European Society of Anaesthesiology. 12 June 2010. Retrieved 1 September 2018. ^ "Anesthesiologist". Merriam Webster. Retrieved 3 September 2018. ^ "WFSA Position Statement on Anaesthesiology and Universal Health Coverage" (PDF). World Federation of Societies of Anaesthesiologists. Retrieved 3 September 2018. ^ "Science Education - Anesthesia". National Institute of General Medical Sciences. Retrieved 3 September 2018. ^ "Who are anaesthetists?". Royal College of Anaesthetists. Retrieved 3 September 2018. ^ a b "What do Anaesthetists do?". Royal College of Anaesthetists. Retrieved 13 April 2019. ^ Wilkinson David J (27 March 1999). "Career Focus: Anaesthesia". BMJ. 318: S2–7187. doi:10.1136/bmj.318.7187.2. ^ a b c d "What's in a name?". Australian and New Zealand College of Anaesthetists. 2017. Retrieved 1 September 2018. ^ "College of Anaesthetists to Change Terminology and Rename College". College of Anaesthesiologists of Ireland. Retrieved 19 October 2018. ^ The Society of Anaesthetists of Hong Kong and the Hong Kong College of Anaesthesiologist (2014). 125 Years of Anaesthesia in Hong Kong: Past, Present and Future (PDF). Hong Kong Academy of Medicine Press. p. 40. ^ Yamamoto S, Tanaka P, Madsen MV, Macario A (February 2017). "Comparing Anesthesiology Residency Training Structure and Requirements in Seven Different Countries on Three Continents". Cureus. 9 (2): e1060. doi:10.7759/cureus.1060. PMC 5364083. PMID 28367396. ^ "Press release on sedation for minor surgery". Sahk.hk. 2006-03-01. Retrieved 2012-10-28. ^ Isaak RS, Chen F, Martinelli SM, Arora H, Zvara DA, Hobbs G, Stiegler MP (June 2018). "Validity of Simulation-Based Assessment for Accreditation Council for Graduate Medical Education Milestone Achievement". Simul Healthc. 13 (3): 201–210. doi:10.1097/SIH.0000000000000285. PMID 29373383. ^ Eloy JD, Amin MD, Pashkova AA, Svider PF, Mauro KM, Eloy JA (2017). "Fellowships Represent a Logical Target for Cultivating Research in Academic Anesthesiology". J Educ Perioper Med. 19 (3): E607. PMC 5868370. PMID 29600256. ^ "American Society of Dentist Anesthesiologists". www.asdahq.org. Retrieved 2018-05-15. ^ "American Society of Dentist Anesthesiologists". www.asdahq.org. Retrieved 2018-09-03. ^ "Anesthesiologist Salary". US News. Retrieved 2017-10-05. ^ "8 Statistics on Annual & Hourly Anesthesiologist Compensation". Becker's Hospital Review. Retrieved 2015-02-17.